12/02/2019 - Today, at the OECD Headquarters in Paris, H.E. 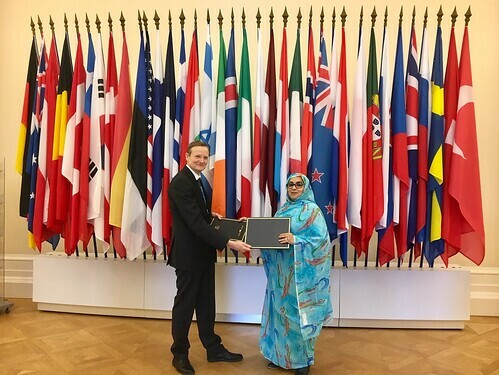 Aichetou Mint M’Haiham, Ambassador of Mauritania to France, signed the Multilateral Convention on Mutual Administrative Assistance in Tax Matters (the Convention) in the presence of the OECD Deputy Secretary-General Ludger Schuknecht. Mauritania is the 127th jurisdiction to join the Convention. L-R: OECD Deputy Secretary-General Ludger Schuknecht; H.E. Aichetou Mint M’Haiham, Ambassador of Mauritania to France. Media queries should be directed to Grace Perez-Navarro (+33 1 45 24 18 80), Deputy-Director of the OECD Centre for Tax Policy and Administration (CTPA) or the CTPA Communications Team.